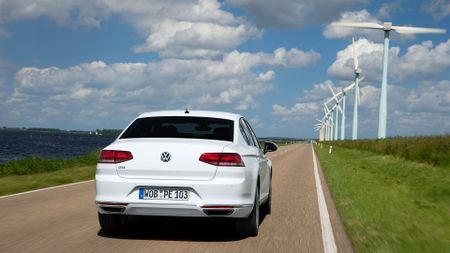 We test the new plug-in hybrid version of the Passat, to see if this 39g/km company car champion is ready to take on premium hybrids from the likes of BMW, Ford and Mercedes. 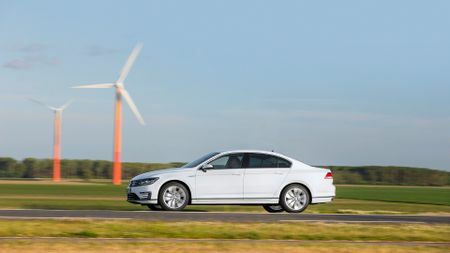 The Passat is a brilliant car, and the Golf GTE is one of the best plug-in hybrids around, so perhaps it’s no surprise that combining the two has deeply impressive results. On the cars we drove, the refinement of the powertrain and cossetting ride make the GTE a supremely relaxing cruiser, and pulsing silently through town is very satisfying. 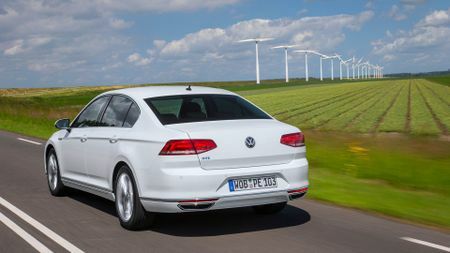 It’s pricey, though, and our reservations about the UK charging infrastructure remain, so unless you can charge it regularly and at home, you might be better off buying a much cheaper diesel Passat. The second VW to wear the ‘GTE’ badge after the Golf. It’s a signifier of the plug-in hybrid technology on board, which promises tax-dodging CO2 emissions, and strong performance, too. 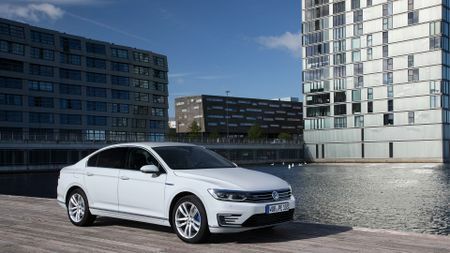 The Passat uses a brawnier version of the 1.4-litre TSI petrol engine in the Golf GTE, has a slightly higher capacity lithium-ion battery pack, and a punchier electric motor to cope with the increased weight of the Passat’s larger body. The net result is that the saloon is a bit quicker than the Golf from 0-62mph (7.4 seconds versus 7.6) and has a higher top speed, but the all-important electric-only range remains an identical 31 miles from a full charge. VW has high hopes for the car, too, as business users have flocked to buy the Golf GTE in their droves, forcing the UK market to increase its allocation. So, with its stronger fleet credentials, the Passat could be even more of a hit, as it’s also available as a practical estate. Smooth, quiet and impeccably refined, so it should suit most company car drivers perfectly. 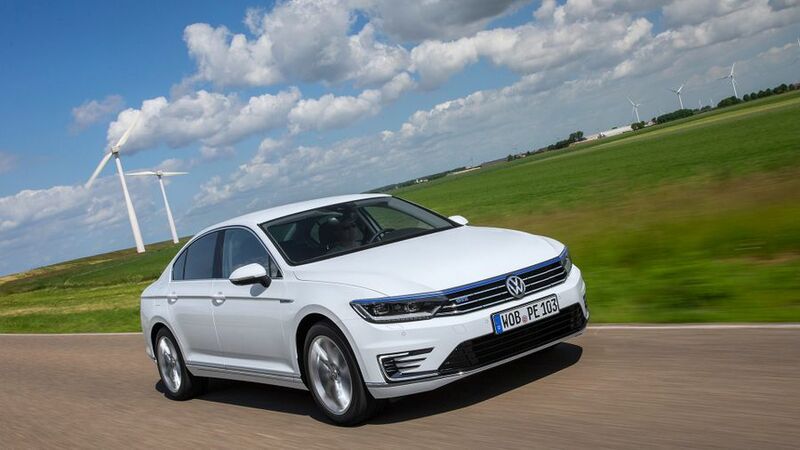 One of the issues with other plug-in hybrids is that the extra bulk of the battery pack spoils the ride and the handling, but VW’s engineers told us that despite weighing around 250kgs more than a standard diesel Passat, the GTE is no weightier than the bi-turbo 4x4 model. Each journey (provided you have enough battery charge) begins in the virtually silent ‘EV’ mode, but the GTE has several different buttons to play with to alter which power source takes centre stage, and govern what the driving experience is like. You can choose to run on petrol alone, use the engine to recharge a depleted battery, go emissions free, or hold onto your battery power, only choosing to use it once you reach a busy town or traffic jam. 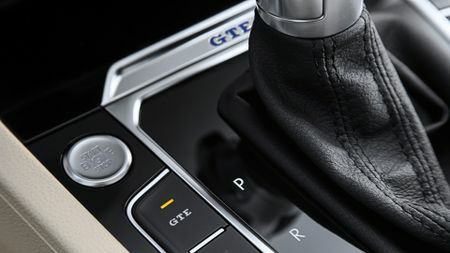 If you want the regenerative brakes to harvest as much energy as possible, you simply pull the gearstick into ‘B’ mode, and they’ll aggressively slow the car down as soon as your foot leaves the throttle. Push the button marked ‘GTE’ and you’ll enter ‘full power to the engines’ mode, as both the 1.4-litre motor and batteries give their all for a combined 215bhp. It feels pretty quick in this mode, although the petrol engine does become a little vocal if you start to rev it out. The instant torque of the electric motor makes the Passat feel quite swift off the line even when you’re running on the batteries alone. So, the powertrain is impressive, then, and makes the complex engineering easy to use on the go, but what about the handling? Well, it’s fair to say the Passat GTE rewards a patient driver. Just like the standard Passat, the steering is accurate and well weighted, there is more than enough grip to ensure it feels rock-solid in corners, and the ride (on the optional adaptive dampers at least) is superb. However, every time you need to brake hard, or try and sling it into a bend a bit too quick, you’re very aware of the extra mass of the battery pack dragging you out of line, so you’re better off just driving this car gently and appreciating its abilities as a hushed, compromise-free commuter. Overall refinement is deeply impressive, but again, every test model we drove came fitted with double-glazed windows and adaptive dampers, which are due to be optional in the UK, so we’ll wait to try the car in a more representative spec before delivering our final verdict. Happily, the battery pack is swallowed by the spare wheel well, so boot space on both the saloon and estate remains unchanged, and close to the class best. The cabin is beautifully built, with high quality materials throughout, and tremendous attention to detail. Those in the back are treated to ample leg- head- and shoulder room, and visibility is top-notch. 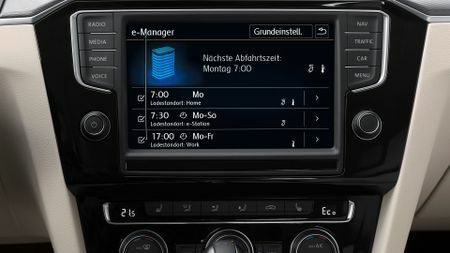 Some of the cars we tried were fitted with the brilliant 12.3-inch digital dials from the Audi TT, which give you a choice of various different readouts for electric range, speed, charge and so on, but also display map information, and allow you to control the infotainment. It’s a shame, however, that this technology won’t be available in the UK until October next year. The charging paraphernalia all fits neatly into a cloth bag under the boot floor, while the socket itself is integrated neatly into the flat-sided grille, and opens with a gentle push. It takes around four and a half hours to charge from a standard household plug, and about half that time if you use the higher output seven-pin plug along with a fast charger. 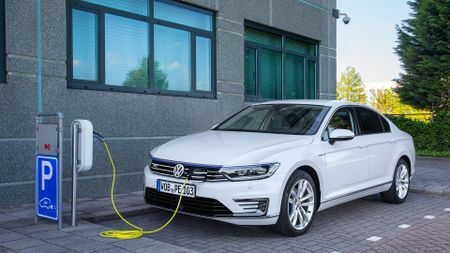 If you are a business user, then plug-in hybrids represent a huge cost saving, and the low CO2 output, smooth powertrain and stunning, spacious interior should put the Passat GTE right at the top of your shopping list. However, there are some caveats to that ringing endorsement. Firstly, unless you can charge the car twice a day, you’re unlikely to get anywhere close to the official economy figure of 166mpg, and on longer runs expect to get around 70mpg when using the engine and batteries together. That means ideally you need to charge it at home, so a driveway to park it on is an important consideration. The GTE is also, it has to be said, expensive for a Passat. The saloon will start at around £38k with prices for the estate expected to begin around the £40k mark. Both models qualify for the £5,000 O-LEV government grant, and come generously equipped, but it’s still a lot of money to pay for technology that even VW itself admits is a ‘bridging technology’ until batteries improve and increase the all-electric range well beyond 30 miles. 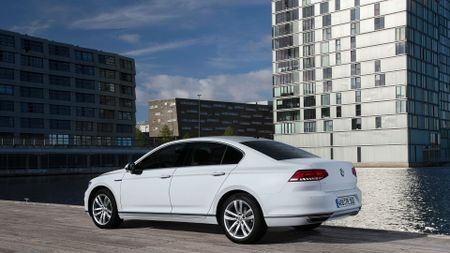 More of a performance hybrid than the Passat, and pricier too.